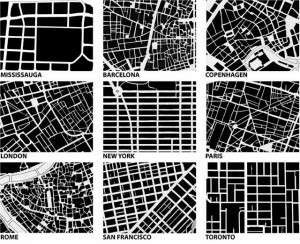 Urban fabric is the physical form of towns and cities. Like textiles, urban fabric comes in many different types and weaves. Coarse grain urban fabric is like burlap: rough, large-scale weaves that are functional, but not usually comfortable. Such places consist of one of two things. Large blocks, predominated by big box stores and other car contract retail and corporate centers, or multi-block mega project dropped on a city without integrating the surrounding city or community. Not only do coarse grain fabrics NOT provide many opportunities for interconnecting; the fabric itself is usually inhospitable to interaction. Instead of asserting control over the street, such places turn inward, fortifying themselves against the perceived dangers of the outside. This begets yet more undesirability. In this regard coarse grain acts as a barrier for all but those who are there for a specific purpose. Just as we are not comfortable wearing a burlap shirt, we are not comfortable spending more time them necessary in coarse-grained places. On the other hand, there is fine-grained urban fabric. Like high count egyptian (or perhaps pima) cotton; fine grain urban fabric can feel luxurious and want to make people linger in or around it. Fine grain urban fabric consists of several small blocks in close proximity. Within each block are several buildings, most with narrow frontages, frequent store fronts, and minimal setbacks from the street. Streets and opportunities to turn corners are frequent, and as a result, so are storefronts. This offers many opportunities for discovery and exploration. There are virtual no vacant lots or surface parking. Also, as there are more intersections, traffic is slower and safer. Fine grained urban fabric is not imposed on a community like its coarse cousin. Rather, it evolves over time in a piecemeal way, responding to what came before, and adapting to what came afterwards. This evolutionary process creates place that are not frozen in the era when they were built, but are dynamic and reflective of a neighborhood’s changing needs. This creates an urban fabric that can seamlessly evolve over time from lightly developed residential areas to mixed-used retail to dense urban core, if that’s what the community desires. In this way, there are far more resilient than the mega projects mentioned above who, when they lose a single tenant, often fail. 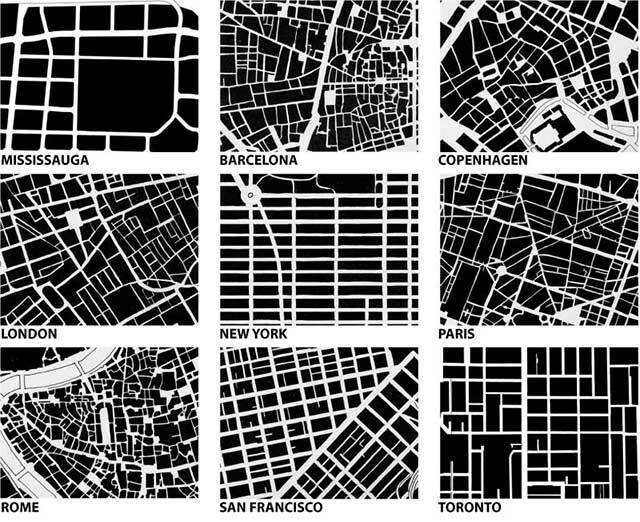 This post is based on “Urban Fabric: The Form of Cities” by Yuri Artibise. It was originally published on the Yurbanism blog.